Deadpool Kills the Marvel Universe Again review: packed tight with energy and delicious dialogue – AiPT! Does ‘Deadpool Kills the Marvel Universe Again’ recapture the magic of the first time around? This volume collects all five issues of the Deadpool Kills the Marvel Universe Again series. If this isn’t your first rodeo and you’ve already read Deadpool Kills the Marvel Universe, then going into this collection, you should know exactly what to expect. And even though this may be the case, trust me, reading Deadpool Kills the Marvel Universe Again will be just as exciting of an experience as it was when you witnessed Deadpool slice and dice his way through the Marvel Universe the first time. Throughout this five-issue run, there aren’t any moments void of action or excitement or humor, and thus, reading through this collection is incredibly enjoyable. I myself couldn’t put the book down, nor could I lose the smirk that the second page of this trade painted on my face. Writer Cullen Bun and artist Dalibor Talajic have done it again; the well-written and well-illustrated pages of this collection are packed tight with energy and easy to devour on account of the tasty line work and delicious dialogue. I especially enjoyed how the creative team behind this book give readers the opportunity to see things through Deadpool’s eyes amidst all of the chaos that comes from, well, killing everyone. While this collection is far from disappointing, I can say that early on, it becomes obvious how the run is going to end, and the ‘storyline’ isn’t all that necessary, and ends up laying dead in shadows of the gratuitous amounts of violence. But then again, who picks up this book expecting to be simulated by a thought-provoking plot? 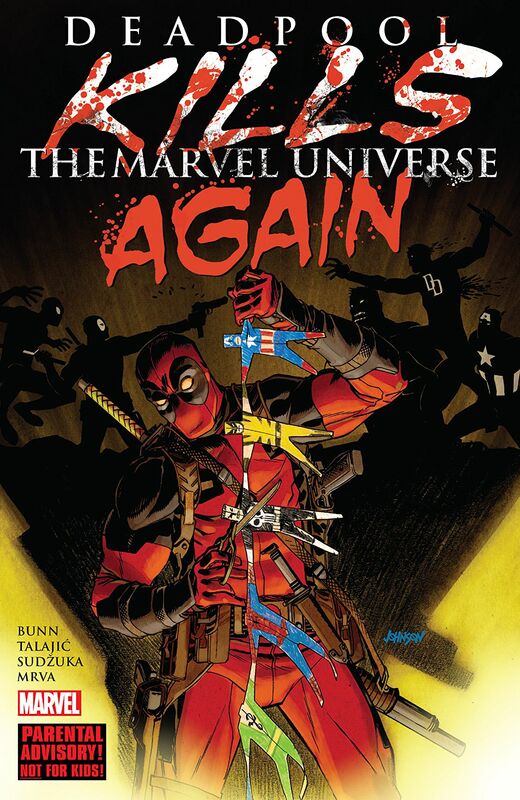 Deadpool is at his best when he’s killing things, and in this collection, he, well, kills everyone... again. If you enjoyed the first time the merc with a mouth took out everyone at Marvel, then you’ll enjoy this, the second time that he gets down to work.